AllGems Limousine Transportation offers safe and reliable Disney Resort transportation service to the various resort destinations owned and operated by Disney. Disney Resorts has a lot to offer families in relaxation, attractions, and entertainment. Considered one of the most popular attractions in the world, Disney World and it's properties are an ideal place for you and your family to relax and take in the Orlando sunshine. The Orlando family of parks and entertainment include Disney World, Wild Kingdom, Epcot Center, Downtown Disney, and many resort facilities. 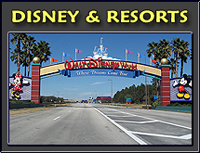 Many families and individuals visiting the Orlando and Central Florida area seek reliable, safe, and dependable transportation for the purpose of visiting Disney Resorts, making their stay entertaining and fulfilling. We offer professional, courteous, and dependable Orlando Disney Resort Transportation Service that is second to no-one. Our transportation vehicles are impeccably maintained, clean, and always in top operational readiness.